What is Dysgu am Goed? Dysgu am Goed is a partnership between Tir Coed and Royal Forestry Society and is an expansion of RFS’ Teaching Trees programme in England. 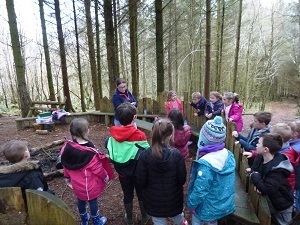 Dysgu am Goed works with woodland owners and managers to arrange educational visits for Primary School children. Dysgu am Goed offers 2 hour sessions in the woodlands to primary school children. 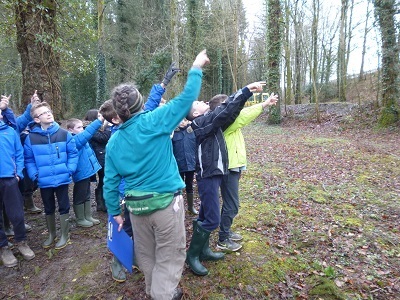 These sessions are curriculum linked with a focus on the natural environment and woodland management. 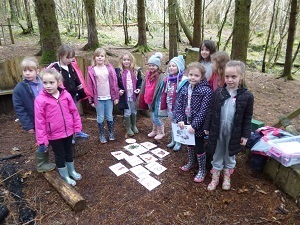 The sessions are held in well-managed woodlands located as local as possible to the schools. The curriculum linked sessions give children the opportunity to learn about trees, woodlands and forestry in a fun and hands-on way. Dysgu am Goed focusses on kinaesthetic learning in the natural environment. Where is Dysgu am Goed available? The initial roll out is in Ceredigion with the support of LEADER funding and Ceredigion County Council, the generosity of RFS Member Roger Eaton and other local RFS Members and woodland owners. This project has received funding through the Welsh Government Rural Communities – Rural Development Programme 2014 – 2020, which is funded by the European Agricultural Fund for Rural Development and the Welsh Government. All 44 primary schools in Ceredigion are offered a 2 hour session for a year group of the school’s choice. It is hoped the pilot will lead to a wider roll out across Wales. You can find us on facebook to find more pictures and regular updates.